School and social successes hinge more on language ability than any other factor for the vast majority of children. Pediatricians and family doctors who have regular contact with infants and their parents are uniquely positioned to help identify young children who demonstrate delayed development within the speech, language and hearing realm. A quick referral to a corresponding specialist for evaluation can make the difference between these infants and toddlers experiencing years of struggle and having the tools to navigate the normal challenges of childhood. Nearly 8% of children 3-17 years of age in the United States have some voice, speech, language, or swallowing disorder, according to the National Institute on Deafness and other Communication Disorders (NIDCD). "The earlier a deficit is identified the better," says Amy Sindelar, pediatric speech and language pathologist (SLP) at Edward Hospital in Naperville, Illinois, and adjunct lecturer at Northwestern University. "Research supports the positive impact early detection within the critical birth to three window has on long-term prognosis for speech and language." A child’s speech and language skills are in their height of development between birth and 3 years of age. Additionally, the formation of the neurological connections that will be maintained throughout that child’s lifetime is occurring simultaneously — intervention during this time period takes advantage of the brain’s plasticity, explains Mark Batshaw, MD, in his book, "Children with Disabilities." While newborn screening for hearing loss is performed in all hospitals across the country, early screening for language development is not. In its absence many pediatricians recommend wait and see approach for this population, recently brought to question by a study of early intervention for toddlers with language delays conducted by Ann Kaiser, Ph.D., and Megan Roberts, Ph.D. The researchers note that while approximately 60% of toddlers with expressive language delays do recover without intervention, only 25% of toddlers with receptive and expressive delays are likely to recover spontaneously. "Because of the apparent spontaneous recovery in some children, there is a tradition of delaying language intervention for this population until it is clear that the delays are persistent," according to the follow-up study led by Roberts and Kaiser along with Laurel Hampton, Ph.D. The study indicates that children with expressive-only delays may catch up to a typical range of language ability without intervention, but additional intervention strategies may be necessary for children with receptive-expressive language delays. Cost-effective treatment alternatives the researchers have been studying include parent training interventions that have been shown as "an effective long-term strategy for children with autism spectrum disorder." Recommendations include implementing language screening children at age two to identify those with the likelihood that their language impairment will persist and improving access to early intervention for children with receptive and expressive language delays. Absence of universal language screening can put pediatricians in the difficult position of having to alert parents to a potential problem that warrants professional evaluation — without definitive evidence to convince them. Sindelar shares about instances where parents weren’t worried about a child’s speech or language delay because a family member may have had some early delays and recovered without intervention. In this situation, parents must be educated that every case is different, and the evaluation will give them what they need to make informed decisions on how to proceed as well as peace of mind. A resource that Sindelar’s own family pediatrician provides are printed handouts for parents that outline age-specific developmental milestones for speech, language and learning similar to those published by ASHA. Not only do they provide helpful information for all parents, they can serve as a non-threatening means for the doctor to initiate that important conversation about how a certain child is developing. 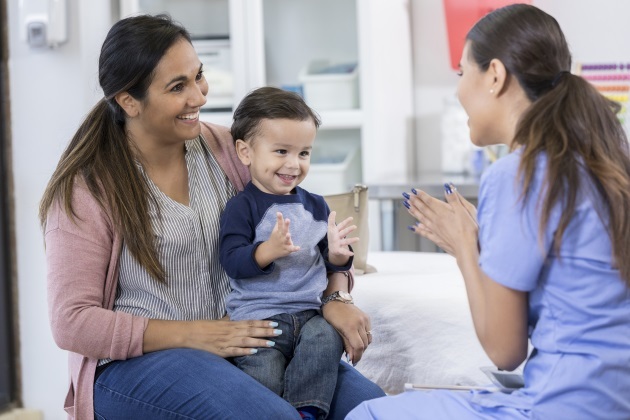 During their doctor’s appointment some children may not open up or allow the pediatrician to observe certain behavior that would indicate a speech or language delay, so parents would serve as the primary information source. Having first words is a common concern of parents — here Sindelar advises looking beyond the words. It is important to look at early sound play that includes babbling but also imitation of sounds and production of sound effects. Red flags to be aware of include when a child doesn’t respond to simple directions, her name or simple songs, and demonstrates limited sound play in addition to delays in single word production. There are many red flags to be on the lookout for as a pediatrician, yet the biggest parent concerns in Sindelar’s mind are when a parent says, "I can’t understand my own child,” or "My child doesn’t respond to the sounds and/or words that I am using."